Sarasota, Florida, is loaded with Arts and Culture (and millionaires) but not a lot of creativity (aside from certain investment managers). Now there is HuB, a cooperative studio where the few Sarasotans under age 40 can pursue work in modern media that’s really interesting. The HuB is an incubator for innovation and creativity. Our members come from all walks of life to realize their potential and find additional meaning in their lives through our supportive community and top-of-the-line creative resources, including photo and film studios, media and tech lab, community space and educational programs. What the artists, thinkers and digital manipulators at HuB are really doing is marketing. And why not? It pays the bills, it commands attention and it can even be fun. Their most successful work to date is “Sarasota Elf.” A digital media ad campaign for downtown merchants that went viral and transcended crass commercialism. Sarasota Elf went from gently shilling stores to promoting holiday events to becoming a real part of the community gleefully sited (and captured on video) around town and interacted with via Twitter and Facebook. Sarasota Elf has lived his entire life with Santa at the North Pole. One day he comes to Sarasota and has experiences unlike anything he's known. Of course he doesn't want to leave. Sarasota Elf succeeds where other character-based social media efforts fail because he was born of creative artists not a marketing department. He’s a character, not a marketing conceit. There’s more to him than a quick joke that brings your attention to the screen in time to see the product. Watch one of his appearances on the local news. The absence of shtick focuses attention on the message rather than the messenger. He’s an adult having a conversation. Yes, he’s got a weird outfit, but he’s at home in it. Look at his audition with Sarasota Ballet. It’s respectful. Anyone else would have fallen back on a slew of gender confusion gags beginning with simply wearing tights. (OMG! His lower torso is covered in snug fitting fabric! There must be something wrong with him!). Instead HuB goes for the most masculine aspect of ballet—the lift—for clean, respectful humor. The personality, and the performance by Joey Panek, come from choosing what’s right for the situation instead of what’s best for the product. Elf’s blind date with the Tooth Fairy (Christine Alexander) is sly, unsophomoric, improvisational fun that unobtrusively plugs 3 sponsors as effectively as it skewers contemporary dating. True love is a fairy tale. Many a holiday marketing program go for whimsy and end up a mess. HuB’s kick at this old can works because they’re not thinking like marketeers with something to sell. They’re creatives who want to make something good—just like every other creative professional. Here is the secret to social media that clients do not or will not understand: it only works if its truly good. Youtube, Facebook, Twitter et al are the consumers’ space. They go there to create their own experiences and they know what’s real and what isn’t. So the one thing you cannot be is phony. 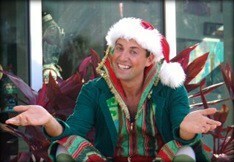 Sarasota Elf is doing his sincere best. The creative folks at HuB are not superior to any of the copywriters and art directors in Sarasota, up the road in Tampa or anywhere in the U.S.. Advertising creatives are CREATIVE and care about nothing more than doing their sincere best. If the people who pay them only trusted them, there would be a lot less bad marketing. For the heavy lifting of a successful social media program always choose Creative Professionals.